DD5LP/P – March 31st. 2017 – DL/AL-171 Eisenberg. As the winter bonus period comes to an end in the DL association on March 31st. and as the weather has stayed beautiful, in fact through this week has slowly got better and better I decided I should fit in one last bonus activation before the season starts again at the end of the year. I considered an 8 pointer (DL/AM-031 Branderschoffen) where I found the Tegelbergbahn lift required to get within 180 vertical metres and 45 minutes walk of the summit is still running (most are closed for maintenance at this time of year) but rather than risk that summit which I have not activated before, I decided to play it safe and have a nice easy activation of Eisenberg – a 1055 metre high “2 pointer” hill with some castle ruins on the top of it and just as important a wonderfully friendly restaurant (Schlossbergalm Zell) about 60 vertical metres below the summit, where I can park my car. Equipment to be used would be the FT-817ND plus amplifier and the 6m portable mast along with the Aerial-51 OCF HF dipole. 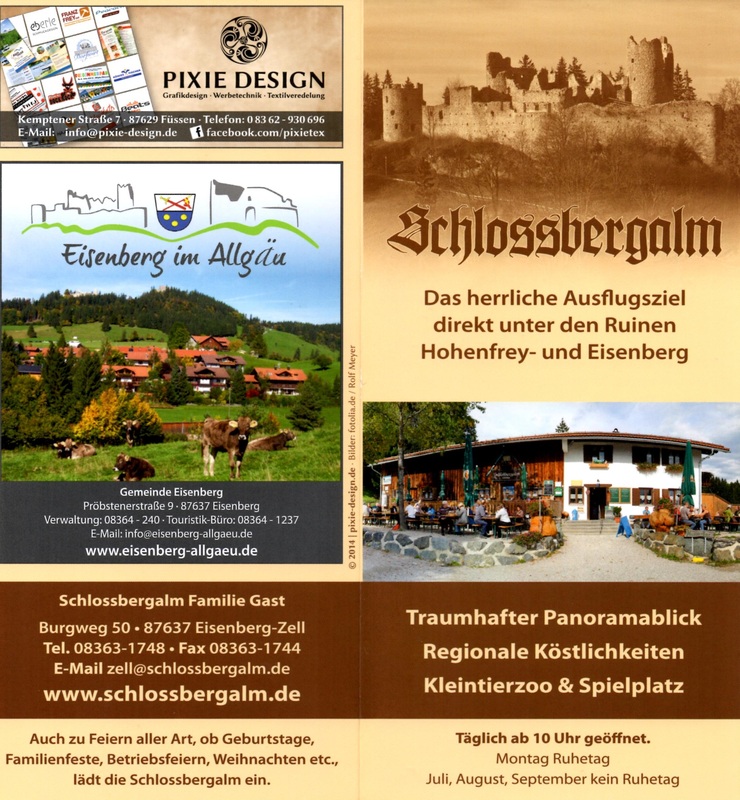 Eisenberg is about a 50 minutes drive from my home QTH near the village of Eisenberg and not far from the town of Pfronten in the Southern Bavaria region of Allgau. I had decided to take this activation slowly as I was not aiming for any DX long path contacts, so after taking our dog “Bonnie” out for her morning walk, I set off from home at 09:30 local time (07:30 UTC). Set the “navi” to guide me, although I know the route well, to find that the unit was determined to take me a different route via the Autobahns – which while possibly quicker is far more stressful than the cross country route that I normally take. It took the Navi at least 15 minutes before it finally accepted the route I was taking (which according to Google maps was the quickest route). Normally the navi is very good. I have downloaded the two German SOTA regions and loaded them onto the programs SD card. It is very useful to be able to simply select the SOTA reference of the summit and let the Navi guide you there. The drive down was uneventful, until I arrived at the restaurant car park to see the restaurant tables full of children, it appears there had been some “clean-up” event as there were also a pile of buckets and gloves near the building, so the snack and lemonade at the restaurant was probably the reward for that. I had the fear that the Castle would soon be overrun by these children, so I set off straight away on the climb to the summit. as it turned out, the group did not come up to the castle ruins and I had the lookout platform all to myself. Once set-up, I self spotted and called CQ. 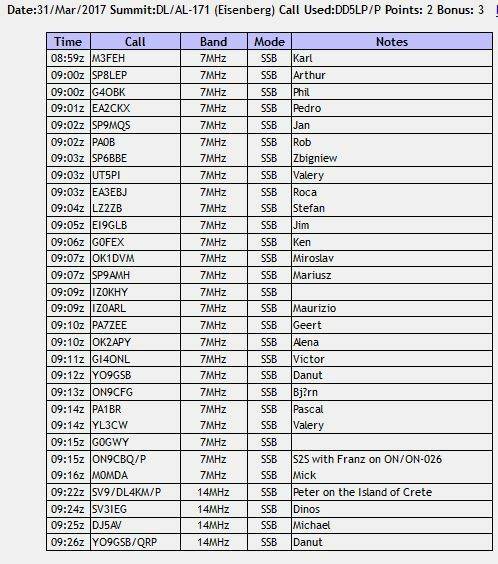 It was great that a foundation licence (QRP) station out of Cornwall in the UK, Karl M3FEH was first in the log today as he often gets drowned by the other chasers. I was half expecting a pile-up and while I got 25 contacts on 40 metres in 18 minutes, this was not nearly as hectic as the activation of Ammerleite ha been two days earlier, so conditions were not quite as good as then however, again, better that predicted. Having run out of chasers on 40 metres I took a couple of minutes to take a few photos and then switched to 20 metres where conditions were awful. I did manage 4 contacts there but after there were no more calls, I decided to pack-up and head down to the restaurant for a Weissbier and some käsespätzle, exactly at noon. A nice end to a successful short activation. The drive home was uneventful and I was back in time for our dog’s afternoon walk at 14:30. There was one strange occurrence during the activation – my mobile phone gave an error saying the battery was getting too hot. I rebooted it and it still gave the error, so I pressed ignore and carried on. There doesn’t seem to have been any permanent damage however I will need to look at keeping the phone out of the sun on any future activations when the weather is so nice. Modified QAMP amplifier (20W on 20m, 35W on 40m). A nice morning out in the hills topped off by a nice meal at the restaurant sat outside in the sunshine, looking over the valley – what is better? On the technical side, I need to consider the heat problem on the equipment when sat in the sun. I had this issue in Australia and actually added white “Fablon” (in German D-C-Fix) sticky backed white plastic on the top of the FT-817 case to reflect the heat. It looks like I will need to do that again for both the FT-817 and my homemade amplifier case. How I can avoid the phone complaining that it is getting too hot is another problem – perhaps I can make a foldable box for it to sit in, that not only protects it from the heat but also keeps it visible is high sunlight? It also appears that my adjustment of the compressor in the microphone since the last activation has worked fine as I had no complaints on audio quality this time. DD5LP/P – March 18th 2016 – DL/AL-171 Eisenberg. Having had to abort the activation of Eisenberg and Falkenstein about 6 weeks earlier due car problems (turbo on the engine failed and wrote off both the turbo charger and the main engine block, making the car a write-off), I decided this would be a good way to try out the new car, while picking up the winter bonus points before the end of March. I had also done some changes to my small Ramsey QAMP amplifier that I use with the FT-817. As well as increasing the power by raising the voltage from the 13.5v to 16v (the power transistors are supposed to run at 28v for full output), I had also added some suppression to the brushless cooling fan that I have fitted. As both summits are only about 15 minutes walk from each car park, this was going to be a “two-bag” activation, taking more equipment than essential, in case something failed and so that I could test out a couple of different configurations. Access to Eisenberg is best made from the car park of the Schlossberalm Zell restaurant, where I intended to have lunch. It’s a really friendly restaurant with fantastic views and simple, good food. This is a good summit to go to if you have others with you who are not interested in radio but are happy sitting on a sun desk enjoying some drinks and food. Eisenberg is about a hours drive from my home and on the route to Falkenstein above Pfronten which is about another 20 minutes drive away, making these two and four point summits a good (easy) pair to combine. Access to Falkenstein is via a private road (€4 charge for use) which has a timed 1 way system with 45 minutes in each hour for cars going up and 15 minutes every hour for cars to drive down. About half way along this private road there is a track which leads off to Zwolferkopf, another SOTA four point summit about a 25-30 minutes walk up through the forests and along the ridge. 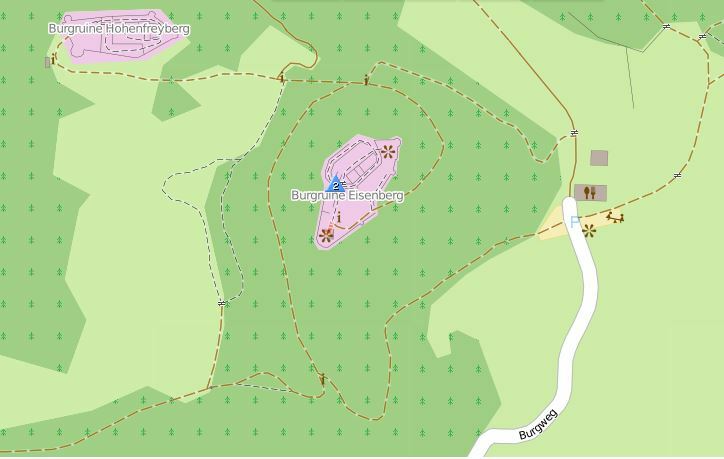 I was not intending to activate Zwolferkopf on this trip unless I had a lot of free time as it would need the additional walk from either the top or bottom of the private road as parking is not allowed at the start of the track. Since most snow where I live had melted a couple of days earlier, I exected no snow and indeed all the way up to the Schlossbergalm Zell car park under Eisenberg, very little was to be seen. Luckily I decided to put my hiking boots on rather than go in my training shoes as half way up the track to the castle ruins the track was covered in snow and worse, as people had walked through the snow the previous day and the snow had melted and re-frozen overnight, much of the track at several points was pure ice. I wish I had packed my add-on shoe spikes as this was so bad but I hadn’t packed them, so with my 9 kilos of radio equipment in two bags, I carefully crept up the track. On some parts of the track the snow had melted and so there was leave covered ground to stand on and on some parts there was fresh, untrodden snow, both of which were better than walking on the ice. The ascent took 20 minutes instead of my usual 10 minutes but as I was ahead of schedule and the sun was out, this was not a problem. I took my time setting up the gear on the lookout platform on the castle ruins before any other walkers got there and was on the air at 09:40 UTC, still 20 minutes ahead of my alerted time. When unwinding the wire on the Spiderbeams UL-404 OCF dipole I found one kink, that had taken the PVC covering off the wire and it looked as if it might have also broken some of the wire strands inside, so I taped up this part of the antenna to avoid any further damage and hoped all was well with the antenna (once I got it home and checked, the wire core hadn’t been broken luckily). I first tried calling and spotting on 20 metres as I saw that there had been some SOTA activity on 20 metres 30 minutes previously. Nothing heard, no replies. I tuned around and the band sounded very quiet. There were a couple of Italain stations on but not much apart from that. I started to wonder if the antenna was actually broken (in fact later other stations confirmed this was simply very bad propagation on 20m at the time). So I switched over to 40m and after a little time had plenty of calls from chasers. The problem on 40m was the amount of traffic there – the opposite effect to 20m and finding a free spot to call that wasn’t being splattered over by a QRO station on a nearby frequency was difficult. Perhaps having found that 20m was dead, the whole of the active European HF population had moved to 40m? I did try 20m again a few times and at the end of the day managed two contacts on 20m – one of which was an S2S contact with Leszek SQ9MDF on SP/BS-005. Talking of QRO, I was running more power than I have been doing for a while. The modified Ramsey QAMP linear amplifier now produces 20w on 20m and 30w on 40m. The reports I was receiving back on 40m reflected this. In some cases I was getting a better report than I was giving. Part of the reason could be that there was some local broadband interference from equipment on the summit. I also have an outstanding problem with noise from the brushless fan that I have mounted in the QAMPs case, the pre-activation suppression work had not been successful. After, for me, a long activation of an hour on-the-air and with the difficult conditions on both 20m and 40m, I decided not to go on and activate Falkenstein. I’ll look at activating Falkenstein and possibly Zwolferkopf as my next activation. If this warm weather continues the snow on the tracks at the even higher summits should clear. Propagation can be very bad at times. Perhaps as we come towards the low point in this sunspot cycle, I should look at the low bands (80m) for contacts from summits? The QAMP is working well with the increased power output, but the 2-3 S points of noise coming from the brushless fan is bad and I need to find a solution. Most recomendations for equipment with these types of fans is to run them off a separate PSU as the interference comes back down the supply leads. A separate PSU is not practical, so I may add a relay so that the fan only comes on when I am on transmit. 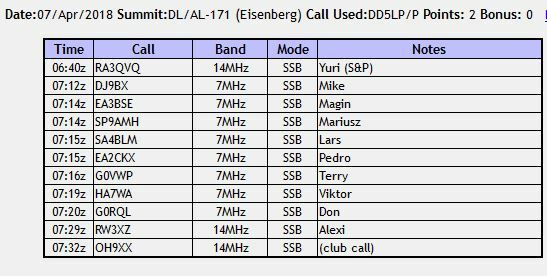 DD5LP – Eisenberg DL/AL-171 Activation XMAS Day 25th. December 2014. This SOTA summit has the ruins of two castles (Eisenberg & Hohenfreyberg). Access is from a track from the village of Eisenberg or a track from the Schlossbergalm, a nice old fashioned Bavarian mountain restaurant located at exactly 1000m ASL. Service is quick and freindly and prices are very reasonable for such a tourist spot. The climb up the remaining 105m is steep in places but the track is well maintained as this is a tourist magnet for the local area. Access to the Schlossbergalm restaurant is up a single track road (Bergweg), that many walkers use – they park at the bottom ot half way up the road and then walk to the top. If like I, you drive to the restaurant, there is parking there for about 25 cars. I did a reccie of the site in November 2014 and activated on Chridstmas Day after two failed attempts – the first thwarted by freezing fog where I had to turn back after only getting about 10 km from home and the second where I had to turn back half way up the mountain as road repairs were being done and the road was closed. The weather on the reccis was sunny with temperatures between 10 and 18 degrees, whereas the activation took place between snow and rain storms with the wind chill factor taking temperatures under zero degrees. Rad access is from the next village of Zell. Go past the Burghotel Bären on Dorf Strasse and then 2nd. right into Burgweg, at the junction in the field take the road on the left. The road is in a reasonable condition but has a metal gate on it, that may be closed if the road is blocked by snow. The summit itself is under the Eisenberg castle ruins. The ruins have two wooden platforms as lookout points. The first, before entry to the main ruin is relatively small but has a wooden bench. The second platform at the other end of the castle ruins has a very large area (one child described it as a dance floor and he was not too far wrong from the size!). This second platform has no seats. Checking with my small SW receiver, there appears to be some electrical noise on 20m on the first platform (possibly from the cell phone antenna mounted on it) 40m seems OK. The second platform has less RF interference on 20m & 40m. Cell phone coverage gives full signal on both Telekom and Vodaphone networks. Time to walk from car to summit (without equipment) – 15 minutes, 20 minutes with equipment. Return (mostly down hill) walk to the restaurant and car park takes 10 minutes. Since the staff at the restaurant were so friendly and helpful – here’s a small advert for them – if you decide to acctivate this summit a stop at the restaurant is well worth while, and not just because you are using their car park and road. As this is a relatively easy summit, with just a 15-20m slog up the last 100 vertical meters from the car park of a mountain restaurant up prepared tracks, I wanted to activate this summit for the VKSOTA on November 15th. I didn’t get 10 kilometres from home before I decided to turn back because of freezing fog. On Thursday 4th. 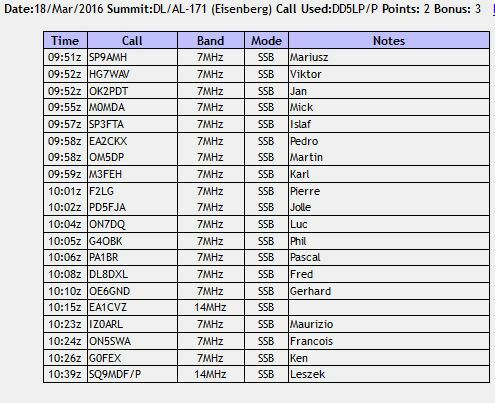 December 2014 I intended activating Eisenberg for an S2S with Eric W4EON on a summit in Virginia. This seems to be an unlucky summit for me as when I had driven over an hour to the base of the summit and part of the way up, the road was closed. A farmer was putting in road markers for when the snow comes and he told me that further up the road it was damaged and being repaired and all this work had started on the very day that I wanted to activate the summit. He told me there was another access track – the other side of the village of Zell, which lies under Eisenberg but when I got there, the forestry commission were cutting down trees and it was at least a 1/2 to 3/4 hour walk to the castle ruins on the summit where I wanted to set-up. I therefore decided rather than letting Eric down I would go to another summit that I activated earlier in the year (Weichberg DL/AL-179) and had driven past on the way to Eisenberg. I got back there and setup just in time for my sked with Eric (I have added a short update on this second activation of Weichberg, with some pictures of the site oprerating in the clouds in the existing report on this blog). When I set off on Christmas day to head for Eisenberg, the weather forecast was for mixed weather and mixed it was! On the journey there, I had heavy rain and high winds. I thought more than once about calling off the activation. The return journey was similar except for the addition of a snow storm around the village of Seeg. Luckily upon arrival at the Schlossalm restaurant car park, the weather was “OK”. A little drizzle but nothing else, so I decided to haed up to the ruins straight away rather than first having lunch at the restaurant as I had planned. This was a good decision. After the 15-20 mins slog up the last 105 vertical metres, it was obvious than winds were going to be a problem and the rain was getting heavier. As I did not have any external protection from the waether in the form of a small tent or bothy bag, I looked to see if I could finf some protection within the ruins and indeed found two small rooms that had sort of a roof over them (actually a third, currently closed viewing platform). So as quickly as I could, I set up the SOTA Hopper antenna on my 6m smini-quid-pole, at a reduced height so that the coax would reach into the semi-protected room. The positioning of the antenna meant that the wires were both not as high off the ground as one would like and one leg was close to the ruins wall, touching it in places. Despite this limited antenna, I checked 40m and could hear several (non-SOTA) stations, so looked on one of the common SOTA frequencies – 7.118 MHz, which was free, so I put out a CQ call at the same time as sending a spot from my smart phone, with already freezing fingers. It’s allright having gloves with me but I cannot operate the the phone or rig with them on and setting up the antenna needed some dexterity as well. End result, by the end of the activation, almost unable to feel my fingers! I managed six contacts on 40m before switching to 20m to hopefully have Phil G4OBK hear me. He had tried calling me on 40m but I was just too waek with him. Well 20m worked fine (perhaps as the 20m part of the antenna was not touching the castle walls) and I worked Phil and two others on 20m. By this time the winds were howling around the castle and the rain had become heavier and changed to being ice-rain, so I decided to call it a day (there were no other callers and no others summit activators active at the time). The pull-down took about a third of the time of the put-up actions and I was on my way back down to the restaurant to thaw out and enjoy a hearty goulash soup along with a Glühwein to get some heat back into the body. As mentioned above, the drive home saw a snow storm and further heavy rain and winds. I was glad I had set off back as soon as I had and suspect that I would not have been able to activate this summit in the following days as snow was now forecast for the next three days. 6 metre squid pole (at about 3.7m high). Winter activations need the use of warm clothing – but how to manage the equipment with thick gloves remains a problem. Even with a limited antenna set-up, it is still possible to activate a summit. Consider a bothy bag or similar for future activations.